We&apos;ve all been there. Once, you were fit, healthy and energetic. But ... ... something went wrong! Now you want to be that person again! If it&apos;s been a while since you did much exercise, starting again can feel a bit daunting. 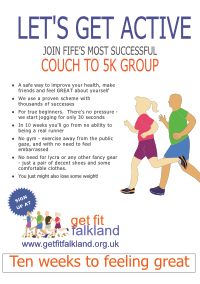 The Get Fit Falkland Couch to 5K programme is designed tor people just like you. We understand how difficult it can be to get and stay motivated. We know you might feel a little bit embarrassed. We appreciate that maybe you&apos;re not as young as you used to be. The good news is that these feelings are perfectly normal. We&apos;ve yet to come across any members who didn&apos;t have them. An the truth is that ALL our leaders have experienced those same fears and doubts themselves. The Couch to 5K programme is designed to make it as easy as possible. Nobody will be rushing you - you do everything at YOUR own pace. We start jogging for only 30 seconds - nearly everybody believes they can do that. If you don&apos;t ... try it. Right Now! Even the most unfit people find CAN manage it. If you can jog slowly for 30 seconds, you can now be confident that you will manage our first session! We build up gradually, taking time to let your body adapt and, as far as possible, to avoid any strains or injuries. You&apos;ll have the support of the leaders as you go along, and you can ask whatever questions you like - no question is stupid! We&apos;ll show you how to warm up properly. And how to cool down again. And - most important of all - how to do stretches and exercises that will keep you in tip-top shape. In week nine, we all take a trip to Craigtoun Country Park near St Andrews. That&apos;s where we do our "graduation" session. A 5km route that you take at your own speed. And, believe it or not, NOBODY that goes along has ever failed to complete it. If you&apos;re interested, take a look at the "programme" page. We run the Couch to 5K programme three times a year - October, January and April. We call them "blocks". "Sign up" opens about a month before the block gets under way. So,if you&apos;re ready to challenge yourself, if you&apos;re ready to change, and if you see the "Sign up" link, take it, and fill in the registration form. We&apos;re ready to help you get fit! Not Sure If You Can Do It? Maybe you fancy the idea of jogging but you&apos;re not sure you&apos;re up to it. That’s a normal reaction. Nearly everyone starts with low expectations. But almost everyone who starts this programme will achieve their goal. It’s designed precisely to help people just like you. To help you do one thing - succeed! If you&apos;ve got an existing medical condition and you have any doubts about whether to do Couch to 5K, take a look at our HEALTHCHECK page. This doesn&apos;t cover every condition, but it lists the ones that we&apos;ve come across in previous groups. We don&apos;t know your individual situation, though, and we&apos;re not medically qualified. So if you have any doubts, PLEASE consult your GP or other medical professional. If you&apos;re not quite ready for Couch to 5K, it&apos;s not the end of the world. We can provide you with a "Walk Your Way Active" plan which involves no jogging whatsoever. It uses the same process of building you up, but it&apos;s all about going for walks - gradually going a little bit further. You just do the workouts on your own, at your own pace and progressing at a rate you feel comfortable. You can then think about joining the next Couch to 5K group, the following one ... or the one after that. You do it when you feel ready. And we&apos;ll be at the end of an email to give you any help, advice or encouragement that you need. When Is The Next Course? Our next block will start on Monday 22 April 2019 and run for nine weeks until the "Graduation" run on Saturday 15 June 2019. The weekly group sessions will normally take place on Mondays at 18:30 pm. Week Ten - the Bonus Week - is scheduled for Sunday 23 June 2019. We want to remove as many barriers to participation as possible. But we don’t get any financial help from anyone and, although your leaders are unpaid volunteers, we do have to cover our costs. So we can’t provide the beginners’ programme for free. But we’ve been able to keep the cost to the very minimum. Slimming and fitness sessions tend to cost about £5 a week. But the cost for our "Couch to 5k" programme is a remarkable £20.00 for the entire programme! PLUS you get a free Bonus Week. PLUS you also get a free T-shirt! PLUS after each session, we refresh you with free cups of tea or coffee and bananas. 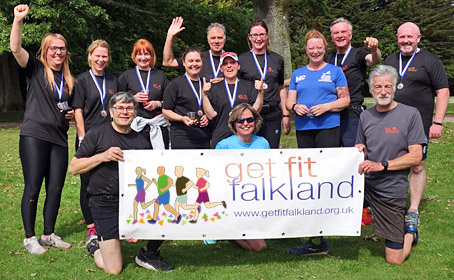 Download the Get Fit Falkland leaflet - we’re an initiative that helps people just like you to become more active. 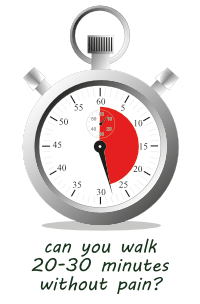 The most important test is whether you can walk for 20-30 minutes without experiencing undue pain or dizziness. A slight ache afterwards is fine. Being out of breath is also OK. But if you feel real pain then sorry, but we can&apos;t accept you onto the programme. Slimming World LAdybank sponsors our Couch to 5K programme. Copyright © 2014 - 2019 Get Fit Falkland. Get Fit Falkland is part of Recreational Running. Member Log In	Developed by MMC Interactive.